This spectacular property within a gated community features breathtaking view on 9.88 acres! Paid off solar system that powers the house. The home offers views from every room, vaulted exposed beam shiplap ceilings, decorative wrought iron railings, generously sized bedrooms and living areas throughout. Less than 10 minutes to I-15! The enormous kitchen features custom cabinetry, granite counters and backsplash, double ovens, more views and a large eat-at center island accented by pendant lighting. The master retreat offers an abundance of room for rest and relaxation plus a private balcony to drink in the views. The spa-like en suite bathroom will spoil you with its large soaking tub, luxurious step-in shower and large closet. A spacious game room adjoins the balcony and includes a bar area and cabinet storage space. All bedrooms downstairs are generously sized and have direct access to the yard, pool, and play area. Every bathroom has been exquisitely upgraded. 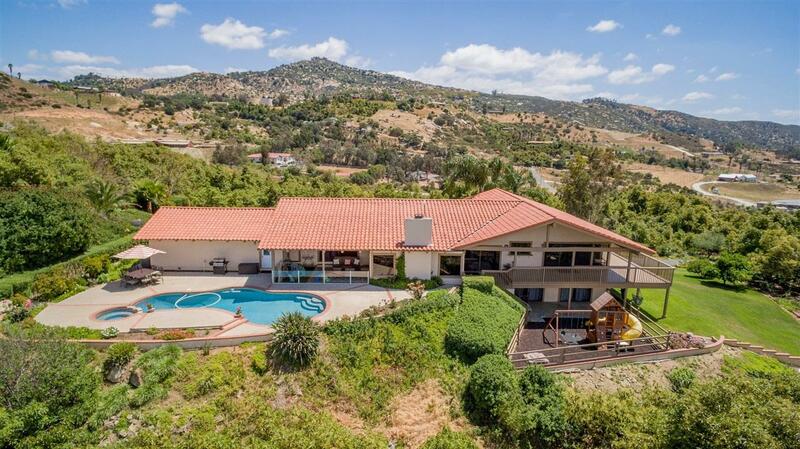 Enjoy the warm summer weather in the pool and spa, on the private tennis court or under the covered patio while gazing upon endless views of San Pasqual Valley and the Safari Park. Two new HVAC systems help when the mild climate needs a little assistance. Located in the heart of Highland Valley wine region with multiple wineries in close proximity, plus vineyard potential on the property! An absolute gem!